Horizon 7.0 AE Elliptical Trainer Review by Industry Experts! The Horizon Fitness 7.0 AE Elliptical Trainer is On Sale! 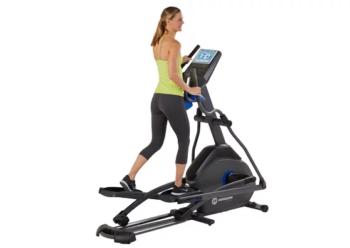 This model is The 7.0 AE Elliptical from Horizon is an exciting option for those looking for both technology and performance with a price tag under $1000. The 7.0 AE provides the quality and comfort we have come to expect from Horizon products in a solid, built to last package. The technology features on the 7.0 AE may not be the most extensive on the market, but the 7” LCD touchscreen is nothing to shake a stick at. The Advanced Bluetooth allows the 7.0 AE to sync with multiple devices on the speakers and the integrated tablet rack puts your entertainment right where you want it. All in all, the Horizon 7.0 AE offers durability, performance and an impressive array of features at a price you can’t beat. MID-WEEK SALE ENDS THURSDAY: Horizon priced the 7.0 AE Elliptical at $999 and they are throwing in FREE Shipping. Smooth Elliptical Stride – The 7.0 AE uses a combination large drive pulley ratio and a heavy 23 lb. 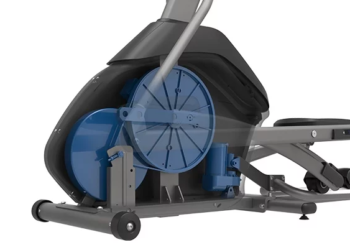 flywheel to create a smooth and efficient elliptical motion. Narrow Pedal Distance – One of the benefits of a front drive elliptical trainer is that you can place the pedals very close to each other, this reduces stress to your hips. Wide pedal separation can be particularly stressful to women. The pedals on the 7.0 AE are about as close as you can get. Optimal Handlebar Spacing – Handlebars are at a 45 degree and are within easy reach. They are positioned where your hands would naturally be on your side. Straight Body Posture – Many elliptical trainers tend to force you to lean forward because of the positioning of your body over the mechanism. On the Horizon 7.0 AE your body is in an upright posture, resulting in more comfort and reducing the feeling of exhaustion. Natural Elliptical Stride – Rather than an oval, bouncy stride, you get a flat elliptical pattern that mimics running or walking on air. This is also less stressful on your joints and lower back. 23 lb. Flywheel – While we already mentioned this as part of the “SixStar Frame’, this is a substantially heavier flywheel than other treadmills in this price range. This places the 7.0 AE a step above its competitors for smooth, steady use. 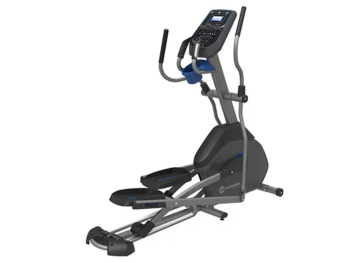 20” Stride Length – A 20” stride length is something that we expect to see in ellipticals over the $1000 mark, so it’s a nice surprise to find this feature on the 7.0 AE. This stride length makes the 7.0 AE comfortable for most users, regardless of height. 20 incline levels – Another great upgrade on the 7.0 AE is the incline feature. This is something that we don’t always see on other Horizon ellipticals. 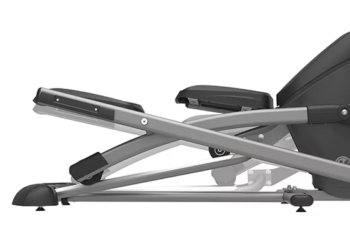 The incline feature allows users of all ability levels to get a wider variety of great workouts. This also allows you to focus on various muscle groups to tone and strengthen specific areas. 20 levels of magnetic resistance – This feature is a step-up from the Horizon entry-level model. The resistance feature is another way to ensure that your workouts are varied and allows you to work a greater range of muscle groups. 194 lb. Unit Weight – Weighing in at 194 lbs. the 7.0 AE isn’t messing around, weighing more than some of the more expensive premium models. This means that not only are you guaranteed a wobble-free workout, the 7.0 AE can accommodate users up to 325 lbs. 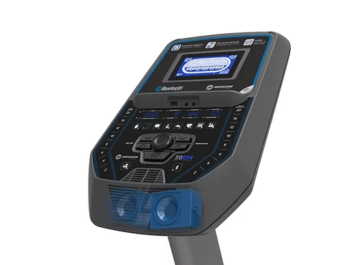 7” LCD Touchscreen – This may not boast the 10” screens that we are seeing on a lot of newer models, but it’s still a definite step up from the LED displays on many models in this price range. Advanced Bluetooth – This technology allows to you connect to multiple devices and stream media to the integrated speakers on the 7.0 AE. Plus, the free no-subscription app lets you push workout data to your favorite fitness apps and control your workout from your device. You can also be sure that you’ll never lose your tunes or entertainment during your workout with the fast-charge USB port. 6 Workout Programs – No matter what you are looking for from your workout, the 7.0 AE has a program suited to you. Warranty – Lifetime frame & brakes, 3 year parts, 1 year generator & labor. The 7.0 AE maintains the high levels of quality, ease of use and performance that we have come to expect from Horizon products. Looking at the specs and features on the 7.0 AE one would very much expect to find a much higher price tag. In fact, the 7.0 AE offers many of the features that we see on the Evolve series machines, but the 7.0 AE is going to cost several hundred dollars less. Horizon has really stepped up to the plate with the 7.0 AE in terms of performance and features. The incline is an awesome addition that we don’t often see on Horizon models. This allows you to better tailor your sessions and work a larger range of muscle groups. The 23 lb. flywheel ensures that you get smooth use every time you step onto your machine. In addition, the heavy weight of that machine itself means that you will always feel solid and steady on your machine. The 7.0 AE is also a great option for larger users, as it can accommodate a weight of up to 325 lbs. Tall users need not fear either, the 20” stride length means the 7.0 AE is comfortable for you too. If you’re looking for a lower priced model, you may want to check out the Horizon EX-59.